Head coach Danny Wilson is confident he can make Cardiff Blues a success but has urged fans to have patience. The region have won just twice this season, both times against Italian opposition, and find themselves second bottom in the Pro12 table. They face Ospreys in a Welsh derby on Saturday and Wilson says rebuilding will take time to get right. "Knee jerk reactions don't lead to long term success," said the former Dragons and Scarlets assistant coach. Wilson left the role of Bristol forwards coach to take over at the Arms Park in the summer. 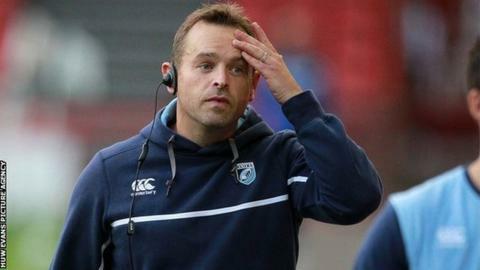 He has also coached Wales Under-20 and promises to make changes needed at the Blues, but warned it is "a patience game". "The long-term plans and goals are part of our discussions with the players signing for the club, whether they're re-signing or are new players," he said. "We here know... what we need to change and bring long-term success to this region. "Sometimes it's hard. We all lack patience including myself, but it is a patience game. "We've got to get through certain things and through certain times now that will help us in the future. "We've made changes to the way we train and the working week and so on. "Now we've got to make changes in all aspects of our current performance end of the game." Blues will be without flanker Ellis Jenkins for the Ospreys game because of a knee ligament injury, but Josh Navidi does have a chance of being fit. Wilson says individual errors have been their particular downfall this season, but the whole squad will do all they can to eradicate them. "It's not just training - there's the whole off-field approach to the game as well as on the field, there's a number of things that change in an environment to get to where you want to get to," he added. "But, as you know, the most successful environments in business and in sport take time to get to. They don't happen overnight. "We'll get there, but it will take time."